As my faithful readers (both of them) have probably noticed, this site has been rather dormant since Election Day. What with the fateful results and the holiday distractions, I have not been in the blogging spirit. I know that will change with the new year, a new computer and fresh resolve to get serious about photography…again. In the meantime, I recently met another photographer/blogger. Dale Keiger is the Editor of the Johns Hopkins University Magazine. His blog will occasionally post a single image along with a quote or just a few pithy words. Brilliant. No need for me to always grind out ponderous essays with multiple images. I’ve got the photos. Why not just throw one up now and then to fill the (ever-more frequent) voids in my creativity. 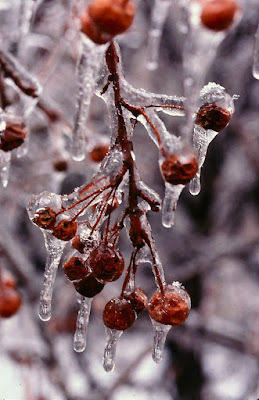 We had our first freezing rain this week. It’s fascinating to see water turn to ice and cover everything. I was reminded of a favorite shot from my film period. The footing may be treacherous but there are images to be found. Understand well the difficulty of keeping up a blog, prior to my school response to the election my previous post was my graduation speech fromantic 2015. Glad you're back! Thank you, Dave. Appreciate your interest and attention. While the idea of posting individual shots and brief, pithy comments is a way to keep the blog going, I really look forward to learning DAM and joining the community of shooters who know what they're doing. I'm not there yet. Happy New Year. Great pics Uncle Ted. Have always appreciated your lens talent, as proven by my request to have you sign photos you gifted me way back when.